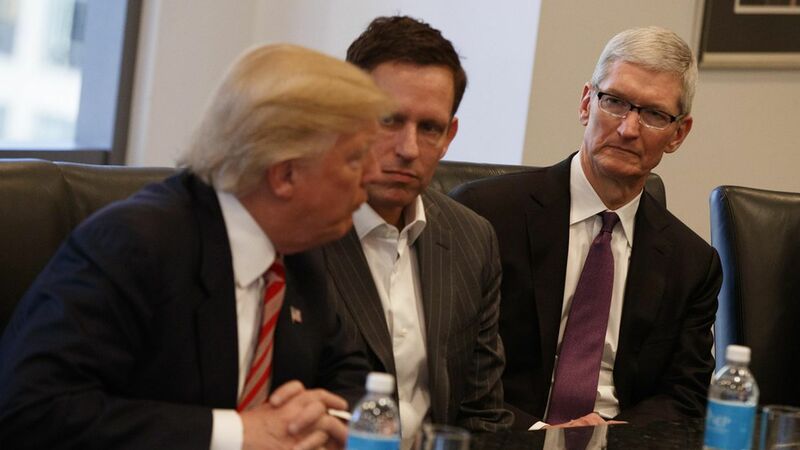 Apple CEO Tim Cook will be at the White House Monday for tech meetings organized by Jared Kushner's Office of American Innovation. It's the first of two heavy-hitter meetings in what the White House is calling "Technology Week." Immigration: Cook will participate in the session titled "H-1B/immigration." He's got a long history of arguing for the importance of immigration to the American economy and doesn't agree with the Trump-Bannon-Sessions view that unchecked immigration has been driving down wages and stealing jobs from Americans. Encryption: Cook will "fly the flag" for strong encryption. This has been a controversial issue within the administration and it remains unsettled. Shortly after the San Bernardino shootings, Trump called for a boycott of Apple products because Cook refused to cooperate with the FBI after it requested that Apple create a special version of its operating software that would have given the government a backdoor into the iPhone used by the terrorists. Cook took a lot of incoming after saying it'd compromise customers' privacy and security. Some argue Cook has been vindicated given subsequent leaks from federal agencies. Veterans' affairs: How to better serve vets both in the provision of medical care and in hiring policies. How the administration talks about human rights: Ensuring it remains a priority for the U.S., both domestically and internationally. I'm told the White House won't be rolling out any new policies or signing any executive orders related to technology. Tomorrow: Attendees are expected to include Alphabet Chairman Eric Schmidt, Amazon's Jeff Bezos, Microsoft's Satya Nadella, IBM's Ginni Rometty, Oracle's Safra Catz, and venture capitalist John Doerr, among others. Cabinet secretaries will attend and the President will drop by, too. Wednesday: Per a White House official: "We're taking the tech conversation to rural America ... [W]e'll be in Iowa talking about agriculture and technology and showcasing the latest technology that is changing the way farmers produce, harvest, and market food." The event will double as a send-off for Iowa Gov. Terry Branstad, who's heading to China to be the U.S. ambassador. Thursday: Breakout sessions focusing on 5G and the Internet of Things, the commercial use of drones, and what the administration can do to spur innovation. The attendees are expected to come together after their more specialized sessions for a meeting with Trump. C-suite level executives and general partners from venture capital firms have been invited. Commerce Secretary Wilbur Ross will play a key role.